Have you ever done something in life that you feel like “ok, this is a game changer?” Bullet Journal Meal Planning is mine! If you aren’t on the Bullet Journal train yet, then hop on and let’s take you for a wild ride into this fantastic organizational trend. You know it’s popular when the kids know all about it and how to use them! Bullet journaling is so simple on one hand and yet revolutionary on the other. They are bound journals (or blank dot grid bullet journal pages here on our site for free to try out!) filled with pages for you to do as you wish. For the people that are saying “I don’t understand!” Yep, I get it. But stick with me. The blank pages are meant for the user to have the freedom to be creative and structure them as they want. 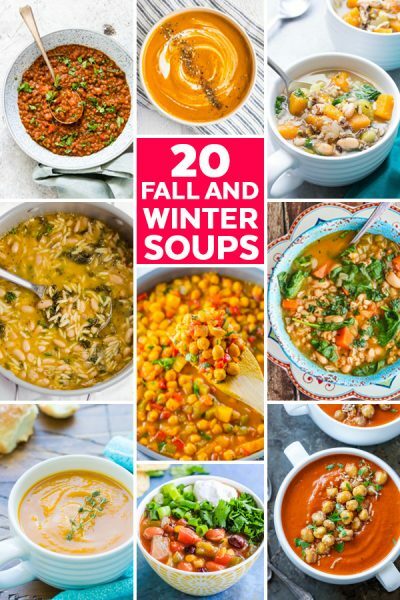 In this case, we will be organizing them for meal planning. You simply write out a list of dinners you want to make for the week, or take it up a notch and add menu planning, and grocery store lists. 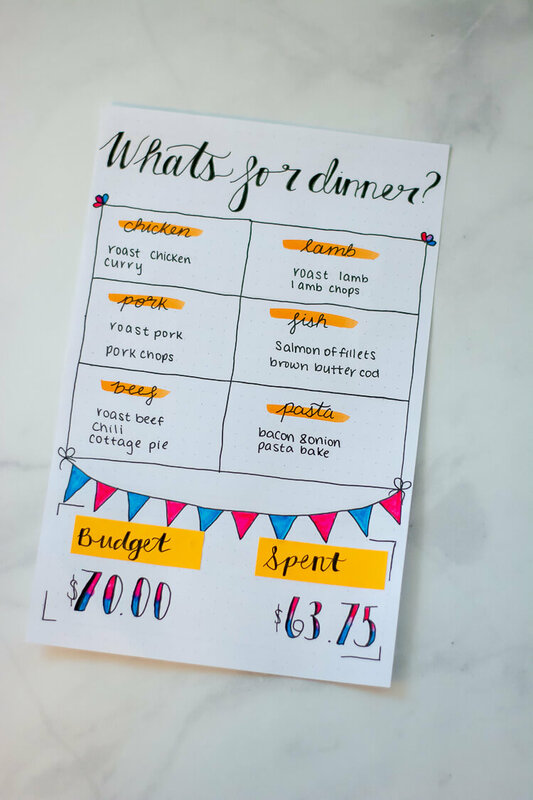 I sometimes even write out the recipes and track my grocery budget compared to the actual spend. It’s all up to you how you will use it. Have used them? How have you adapted it for your busy life? How does bullet journal meal planning work? 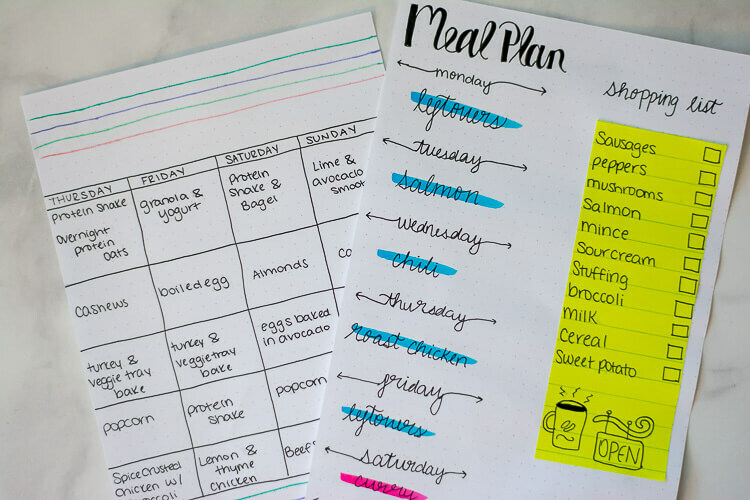 There are hundreds of ways to organize and plan your meals using a bullet journal. If you are ready to jump on the bullet journaling bandwagon, print out a few dot journaling pages from our site and let’s get started! Since there are so many options available, decide where you want to start with your meal planning. You don’t need to go ALL IN right out of the gate! That is just too big of a life adjustment. If used well, it will be a great success for you! Start by just meal planning dinners for the first few weeks. Look at your week’s schedule to determine what your evenings will look like and plug in recipes that match the time and energy you expect to have. For example, nights you get home late, plan a crockpot meal or something that is placed on a sheet pan and ready in 20-30 minutes. Plan ahead and use your free days. I create my meal plan in my journal on the weekends in between activities. I write in my shopping list and hit the store. Reuse the space in the shopping list page, and write the lists on sticky notes. Prep your meals. Isn’t it funny how much time it takes to prepare for meals each night? My current favorite life-hack for meal planning is to dedicate time to do a thorough meal prep for the week. Trust me, it is worth it! Where possible, cut up meat, chop onions, slice carrots – you name it! 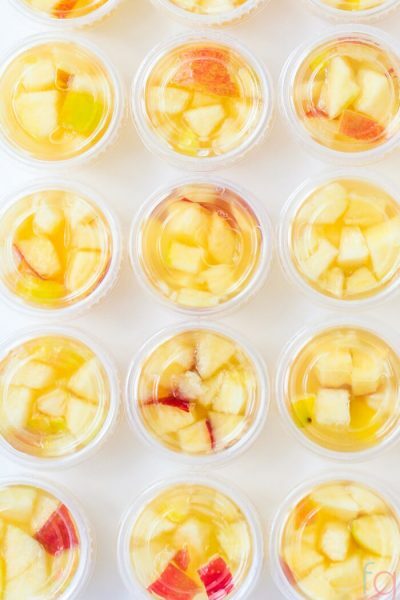 Have them all ready to go in the fridge and it will make your evening cooking go a lot smoother. 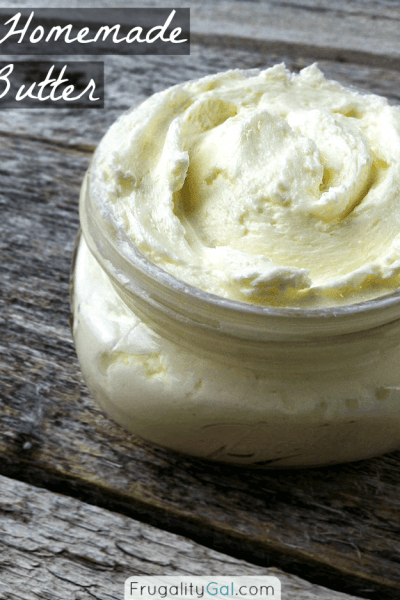 This takes a bit of time to do the prep until you get used to it, but once you get the hang of it, it goes quickly and will save you a lot of time throughout the week. Listen to music, play your favorite movie in the background or listen to a book. 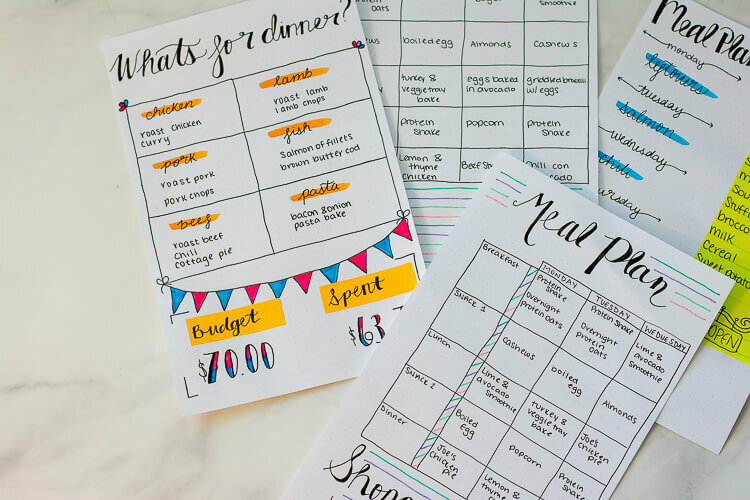 Use your Bullet Journal Meal Plan to guide you on what can be prepared ahead of time. Having that written down saves me from those last minute blunders. Once you have conquered meal planning dinners, add breakfasts or lunches onto the list. Choose one to start with and get the cycle going smoothly before you add meal planning for the others. 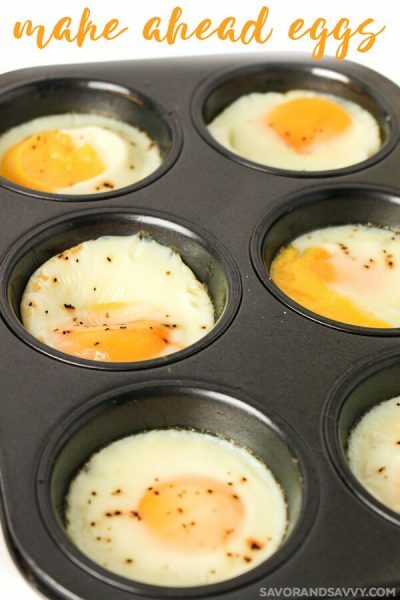 Here are some of my favorite meal-prep breakfasts if you need some inspiration. It might take a couple of months, but once you get all three meals down and prepped, you can work in more advanced menu planning using sticky notes. Write your favorite recipes on the ½ inch by 2 inch sticky notes and stick them next to the days of the week in your bullet journal. You can remove and reuse them time and time again. 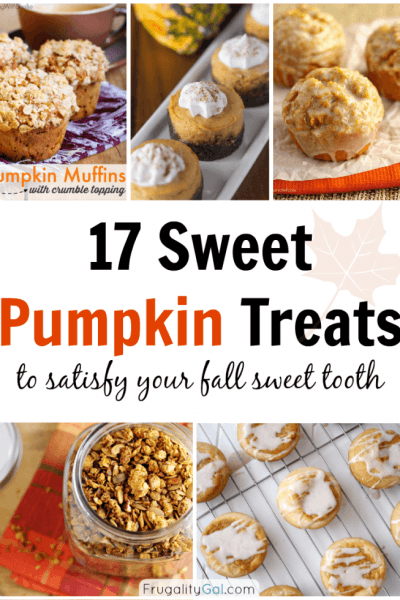 Mix up the weeks and save your favorites. You can meal prep and plan recipes any night of the week. Just fit it in when it works for you and just keep the flow going. There are grocery list printables to write in your weekly shopping needs. But, if you’re like me, just add in the grocery list next to the meal plans. As you plan your menu, just make the grocery list on the bullet journal page. This really pays off in the end, as you’ll have prepared meals with less time wasted running out again for that one item that you forgot. Use good quality pens designed for bullet journaling like this Tombow Dual Brush Pen Art Marker. They are well worth the investment. We would love some feedback! Did you print out the dot journaling page and try it out? How did the meal planning go? Most of all, was it a GAME CHANGER? 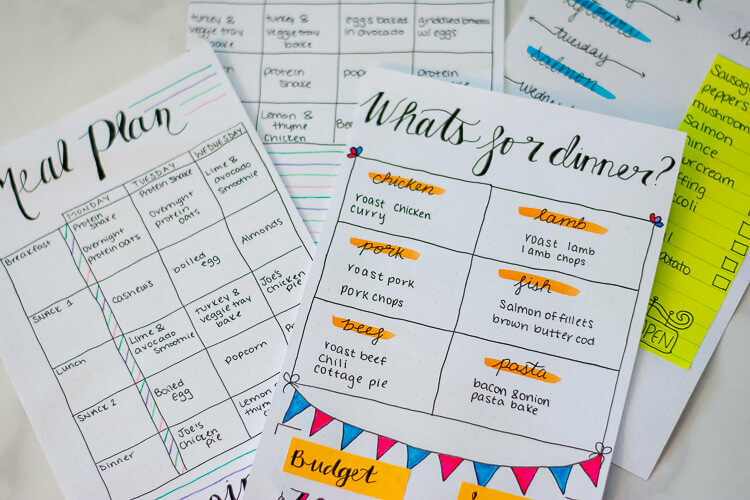 Make sure to check out the ideas we collected on our Bullet Journal Meal Planning Pinterest Page! Let us know if you have one we should pin to our boards! Pin these ideas to your Pinterest Page! 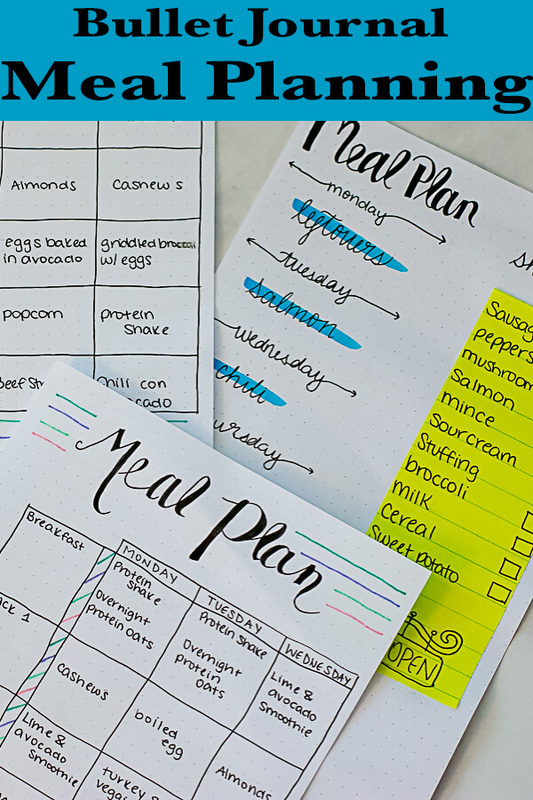 Different Ways to Use Bullet Journaling to Meal Plan the Week.